There isn't enough in the way of All Hallows' Eve theme and/or revival series in the local cinema, which is a shame as this is truly the season for genre film and it's frights, disconcerting surrealism and crepuscular atmospheres. Yet last year's cinematic offering featured a small abundance on the theme of the Haunted House, and 2013 saw no small number of Invaders From Beyond. One of the longest running of the local series has been The Grand Illusion Cinema's annual monthlong All Monsters Attack calendar of horror, thrillers sci-fi and fantasy. This year's installment features a set of the core shock, horror, sci-fi and cult genre gems that audiences have come to expect and a equal offering of foreign and arthouse works from the fringe. Representative of 1980s horror, Don Coscarelli's quintessential "Phantasm" series began with the 1979 titular installment centered around the prototypical group of small town friends who become ensnared in the inter-dimensional schemes (and Sentinel Spheres) of it's cosmic undertaker, The Tall Man. Thirty-seven years later, the film has been restored by J.J. Abrams’ Bad Robot productions in a new 4K restoration supervised by the director. The Grand Illusion has paired the rerelease of the first of the franchise with David Hartman's "Phantasm: Ravager"bas the last chapter in the dimension-hopping machinations of The TallbMan (featuring Angus Scrimm in his final performance). The week beforebthere will be the rare opportunity to witness the poetic desolation andbchanged planetary identity of Geoff Murphy's 1985 New Zealand cautionary ecological sc-fi oddity, "The Quiet Earth". The film's minimalist setting based on the contemporary Craig Harrison novel of the same name, as much as the landscapes of Richard Matheson's 1954, "I Am Legend" and the psychological terrain of Ranald MacDougall's 1959, "The World, the Flesh and the Devil". Equally uncommon, The Grand Illusion will be presenting a double bill of Japanese supernatural classics on 35mm, with screenings of Masaki Kobayashi's "Kwaidan" and Kaneto Shindo's "Kuroneko". The former much like the traditional European tales of feline curse and retribution, such as those featured in the works of Edgar Allan Poe or later Giallo interpretations, have their own long line of Japanese equivocals. This one by the infinitely varied talent of Kaneto Shindo, as detailed in Maitland McDonagh's "Kuroneko: The Mark of the Cat" for Criterion. An anthology of folklore depicting the travails of mortals becoming ensnared in supernatural realms or peril and consequence, Geoffrey O’Brien 's "Kwaidan: No Way Out" documents Kobayashi's interpretation of stories from international explorer, writer and cultural documentarist, Lafcadio Hearn. Namely his same-titled collection of Japanese folktales and accounts of the floating world, "Kwaidan: Stories and Studies of Strange Things". As a late 19th Century cultural emissary, and professor at Tokyo Imperial University, his work chronicling folk traditions and tales throughout rural Japan, earned Lafcadio the rare honorary Japanese name of Koizumi Yakumo. On the 110th anniversary of the writer's death, The Japan Times examined the legacy of a man widely admired as the true interpreter to the west of all things Nippon, "Lafcadio Hearn: Japanese Thru and Tru". John Carpenter's loosely interpreted premise' stemming from H.P. Lovecraft's "The Dunwich Horror" and "At the Mountains of Madness" woven into elements central to his Cthulhu Mythos, as well as Lovecraftian settings and details including the premise of a cursed text as reference to The Necronomicon. "In the Mouth of Madness" structurally resembles a few key works from Lovecraft by employing the device that the bulk of the narrative is recounted in flashback by it's protagonist, from the confines of an asylum for the mentally ill. While not one of Carpenter's greatest, it is nonetheless one of his stronger late-career offerings as explored in Birth Movies Death's Everybody’s Into Weirdness feature, framing some of the brilliant (though brief) set pieces and its overall success at assembling a contemporary pastiche of Lovecraft. Where would a cinematic celebration of All Hallows Eve be without the Vampyric? All Monstes Attack offers a contemporary, urban and decidedly bohemian take on John William Polidori and Bram Stoker's favorite immortal entity, from both the 1980s and present. The first, Tony Scott's 1983 adaptation of the novel of the same name by Whitley Strieber, starring Catherine Deneuve, David Bowie, and Susan Sarandon, "The Hunger" though poorly received at the time, garnered a cult following for it's conclusion of significant players within the nascent Goth and Glam rock cultures. Though dressed in similar cultural garb, Jim Jarmusch's offering in the genre is a beast of a very different nature, "Only Lovers Left Alive" watches instead as "A Tale of Passions Spanning the Centuries". The uninhabited buildings and empty lots of nocturnal Detroit and the music and light filled streets and alleyways of Tangier, places expressive of it's protagonist's Adam and Eve. Languid and sensual, there's definitely something to be said for Jarmusch's depiction of life as an eternal Vampire in which one has all that time to travel the globe, while reading every book ever written, listen to every great record ever made, see all the films we can never hope to squeeze into a human lifetime. His richest film since 1995's "Deadman", it stands as a love poem to the great visionaries, authors, artists, musicians, inventors, thinkers and tinkerers throughout history who have made the world greater by their defiance of the status-quo. Capping it all off, in collaboration with Scarecrow Video and their offering of obscure, unreleased, out-of-print, super-rarities in depths of their genre film archives, this year's multi-title feature centers around the confluence of Horror and that particular late 1970s and 1980s strain of heavy rock and hair, with the "Heavy Metal Horror 35mm Triple Feature Pizza Party"! While we're here, lets talk the incomparable one-of-a-kind resource that is Scarecrow, and how if you live in this city and are a fan of cinema (regardless of genre, era or style) it's essentially your personal obligation to ensure their doors stay open for business. With nearly 125,000 films in their catalog, many out of print, foreign releases or ultra-rare editions, there is no singular online resource that will ever compare. After the passably successful, yet noncommittal nature of Gareth Edwards' entry in the franchise, Toho Studios announced that they would be reviving their own cinematic line of Gojira films helmed by the "Emotional Deconstructionist" behind the landmark anime series of the 1990's Neon Genesis Evangelion and its big-budget Theatrical Rebuild of the 2000's. In a protracted series of public deliberations, Hideaki Anno announced that while psychologically and creatively exhausted from the process of Evangelion's Rebuild, he felt it essential to make the most of the opportunity to offer a new perspective on Japan's greatest movie monster, with his co-director Shinji Higuchi establishing, "Japan's 'Godzilla' Director Wants to Surprise". Higuchi and Anno having previously collaborated on the 2013 retrospective "Tokusatsu: The Art of Making Monsters" with aid from Studio Ghibli and Japan's Agency for Cultural Affairs for MoMA Tokyo. The exhibit, Tokusatsu: Special Effects Museum featuring among other things, decades of painstakingly elaborate sets, costumes, aircraft models, sci-fi devices and technology, designs, schematics, storyboards and monsters of course... no shortage of monsters. The stunningly executed trailer for the exhibit, a collaboration with the work of Shūsuke Kaneko drawns from Hayao Miyazaki's post-Ecological Collapse manga "Nausicaa of the Valley of Wind" and features a sequence of a "Giant God Warrior Appearing in Tokyo". As to be expected in the digital era, the art of this industry is shrinking, with few young directors coming in to advance it's arts, and only two major studios making regular Tokusatsu features, which is the focus of The New York Times' "Rubber-Suit Monsters Fade. Tiny Tokyos Relax". 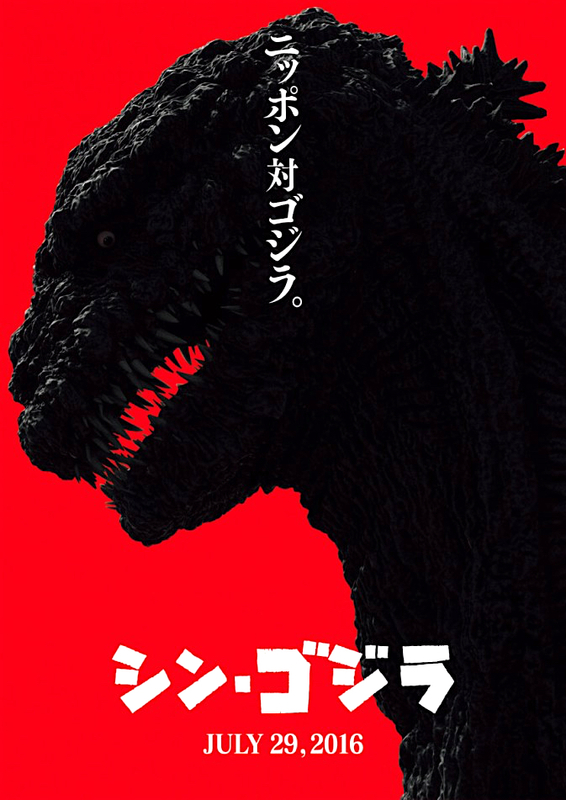 Seemingly there could be no more qualified directors to bring a 21st Century Japanese vision of "Shin Gojira" to the screen than the duo of Higuchi and Anno, and this past July "The Metaphorical Monster Returned" to great theatrical success as once again, "Our Favorite Monster Terrorizes Japan". Retitled "Shin Godzilla" for the western market, the film will have a brief monthlong theatrical distribution throughout major cities in the US starting in October, with Seattle's one week run at Regal's Meridian 16 and single screening at Landmark's Guild 45th.